So we figured as long as we were in Indiana we might as well swing by Colorado and attend Grace's China Sisters Reunion. This is small group of families that all traveled together to bring home our daughters from China. We've met with them every year since Grace came home. Most of the families are from Texas, but a few are from other parts of the country so this year we moved the reunion out of Texas so a few other families could attend. 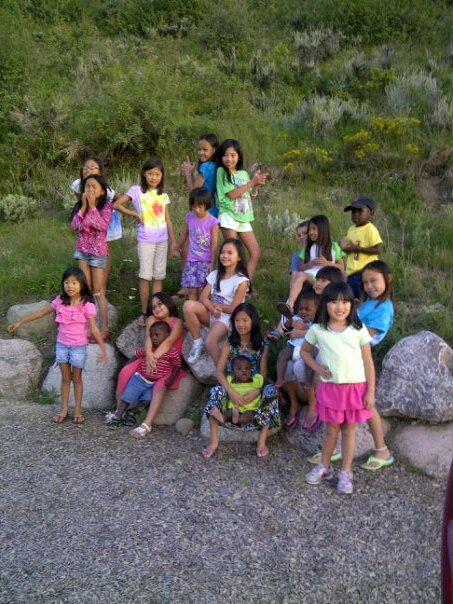 It was a great location and the kids had a ball. There are some older sisters, some younger, a couple of older brothers and my brood of Congolese kiddos. China Sisters and their siblings. Our first stop in Colorado was at Walmart. I forgot to back any warm clothes so we all needed sweatshirts. Out for a nature walk. Manny and JoJo plotting their escape. Sweet Sean teaching Manny to bump knuckles. The boys spent most of the hike sword fighting. The girls caught a snake. I wore Kat in a sling for 2 hours. She's a lot heavier than she was in Congo! Chillin' back at the room with Daddy. After Colorado we started to make our way home. First we stopped at Royal Gorge near Pueblo. It was a great side trip with lots of activities for our kiddos. We almost got trapped with our big double stroller trying to get out of the tram that crosses the canyon. The world is just not designed for double strollers and big families like us! We happened to be passing very close to Brian's sister Cathy in Kansas so Grandma and Grandpa met us there too and spent a couple of days hanging out with family and doing more playing. We blew thousands of bubbles and made an attempt at some family photos. Then we headed to Texas, made one more stop in Fort Worth where we hit a great mall playground to burn off some kid energy and finally made it home. We traveled for almost 3 weeks and drove through 8 states. It was sometimes a bit chaotic and exhausting, but I'd leave again tomorrow if I could. These kiddos are some pretty good travelers! I look forward to many years of summer vacation adventures! Royal Gorge Bridge. Did I mention I don't love bridges that sway in the wind!!! So windy that Haven had to take off his cap. Grace learned to pose from someone at the China reunion. She is doing this in every other picture the rest of our trip. JoJo and Manny rode the carousel. JoJo loved it. Manny cried. Katriel has the sweetest eyes. Haven teaches Manny how to blow bubbles. Aunt Cathy and Grandma making bead necklaces with Grace and Haven. Kat and her doggy cousins. Our hilarious attempts at family photos. Grace didn't want to take the pics so Aunt Cathy bribed her with jewelry. Good call, Aunt Cathy. JoJo up on a tree limb. Manny not enjoying it as much! Cuddling up after a big day of play! Let me out of the van. I need to scream!!!!! Kat was on the move! Grace was showing off her best Olympic gymnastics moves. What a great vacation! Can't wait for next summer!! !